The sports world lost an iconic personality on Sunday morning. Someone who’s reporting style transcended those of his predecessors. Someone that had an uncanny ability to connect and relate with any viewer. Someone who was brilliant with his delivery, creative with his catch phrases, and insightful with his recaps. 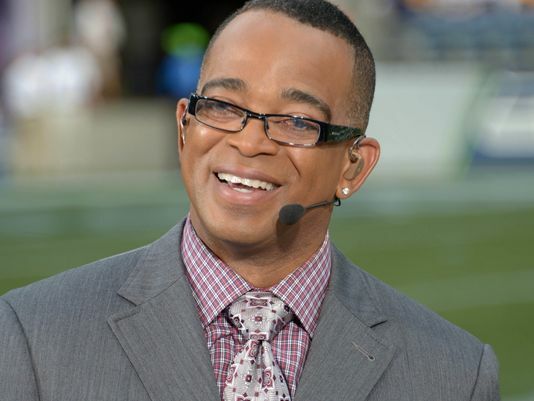 Stuart Scott succumbed to his battle with cancer at the age of 49. Stuart wasn’t just a sportscaster. He was a creative genius who knew how to effectively blend the world of sports and entertainment. He single handily revolutionized sports media. At a time when most sports anchors were dry and bland, Stuart erupted on the scene as this charismatic hip talking commentator. He was able to incorporate hip hop into his sports recaps, often referencing hip hop artists or songs. He captivated you and drew you in. Whether you liked sports or not, you liked Stuart because he was entertaining. And most importantly, he enjoyed his job. His energy and his smile were infectious. Stuart dared to be different. Early in his career, not everyone was a fan of his style. However, he wasn’t a afraid to be himself. And he unapologetically continued to bring you slang in his reports, night in and night out. Eventually, he grew on you. Until you realized that he was the only sports anchor that you would faithfully watch. Stuart could relate to anybody. Stuart had the ability to relate to the stock brokers on wall street, as well as the inner city kids in poverty stricken neighborhoods. Lebron James stated that Stuart “gave inner city kids someone they could relate to that wasn’t a player.” It wasn’t just what Stuart said, it was how he said it. His delivery was impeccable and unparralled from anyone that we’ve seen. I was blessed to be present at the Nokia Theatre last July to witness Stuart give his profound speech at the Espy’s, after being presented with the Jimmy V Award. What really struck me about Stuart, was his calm and positive demeanor. He didn’t have a “woe is me” kind of attitude. He wasn’t asking anyone to feel sorry for him. And he definitely didn’t act like someone who had been diagnosed with a terminal illness. He was thankful, excited, and optimistic through it all. You would have never known what he was battling. I think I speak for most young sportscasters across the nation when I say that Stuart Scott inspired me to enter this profession. It is hard for me to give a recap of any game without habitually using one of Stuart’s catch phrases. He made you discover the joy in sports reporting. He made you realize that it’s okay to be yourself. Stuart embodied everything that you looked for in a role model. He was a dedicated father, a charitable giver, and a loving mentor. More than an iconic sportscaster, he was an iconic person.